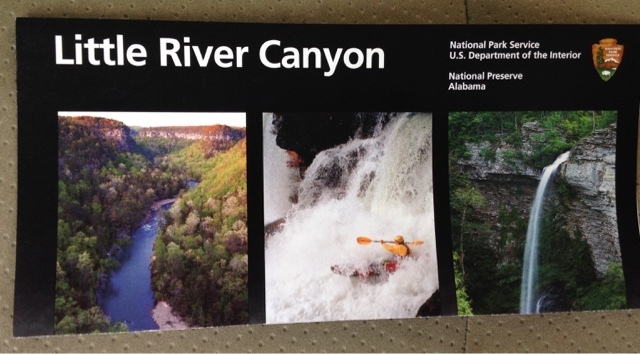 My oldest son told me that I need to check out the "Grand Canyon Of The East" in Alabama while I am here. 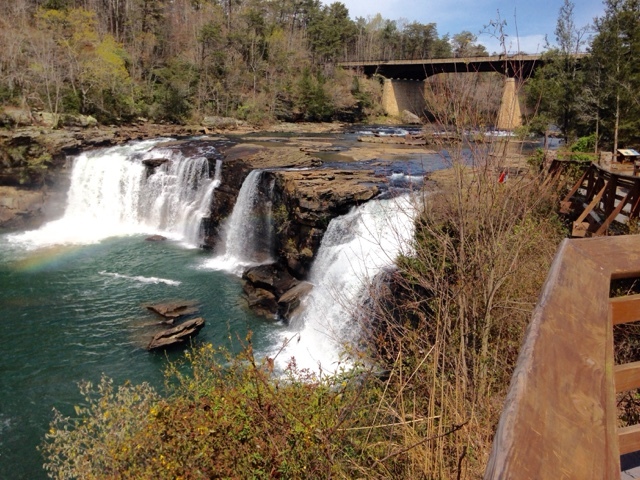 Searching for "Grand Canyon Of The East" brought a number of responses from Southwast states, but he was sure that it was Alabama so the Little River Canyon must be it. I stopped in to the Visitor Center about a mile away and to the left of the bridge. The woman ranger at the information desk gave me a map with the rim road on it showing all the turnouts to overlook the canyon. There is no fee to enter or access the preserve. I watched the movie about the National Preserve prior to coming to the falls overlook. 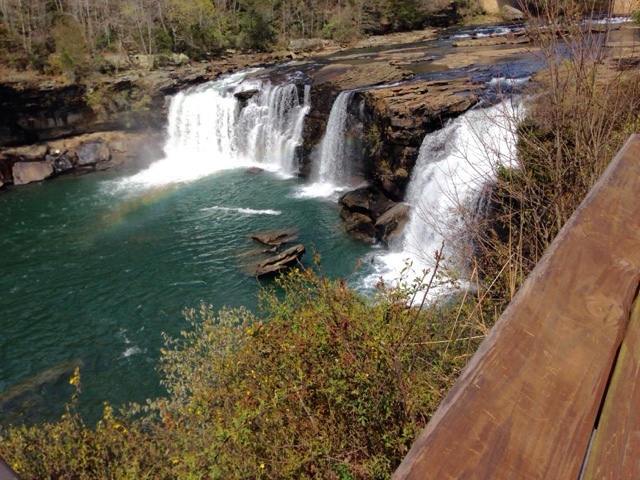 I am told that the spring is the best time to come to see the water flow in the river as seasonal changes in water flow changes the falls and river level. 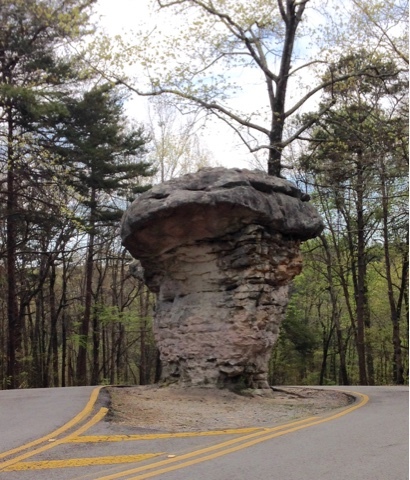 The rim road takes you plast this hoodoo in the middle of the road. The canyon is deep at about 500 feet. The Grand Canyon in Arazona is about 5000 feet deep. 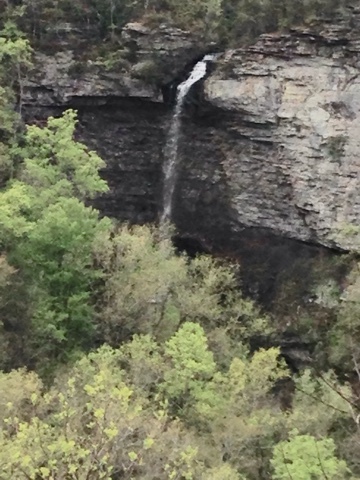 This falls is listed as seasonal so I'm glad I got to see it flowing. I stopped at all the turnouts along the rim road and got out to look at the scenic overlook. There isn't much parking at many of the turnouts, but being a weekday there wasn't any cars at most of them. There is on good hike with parking that I partially hiked that goes to the bottom of the canyon to the river. The trail is the Eberhart Point Trail. It is very steep and is popular in the summer for swimming in the river. It is so steep that in the. Summer any cooling off you may do will be a long memory as you climb back to the top to your car. When you stop at the Visitors Center ask for the hiking map. I didn't hike all the way to the bottom as rain was coming east towards me and I wanted to get back to the GTG before puddles fill the pot holes on the dirt road and obscure the deep holes. The Prius is not happy with large pot holes. If you do ever hike to the bottom be mindful that the river level can change fast making it dangerous at times. 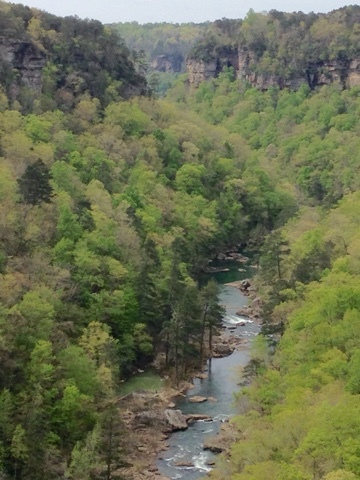 Although this is a nice park and a significant canyon it is hard to compare this to the Grand Canton. Glad you finally went. I thought the place was super beautiful. I'd gladly go back.